Here’s a full list of the Fortnite Season 6 Week 1 challenges. Challenges are split into Free and Battle Pass tiers, but the cut off for the weekly XP reward is still four completed challenges – which means that only Battle Pass players can get the extra XP. 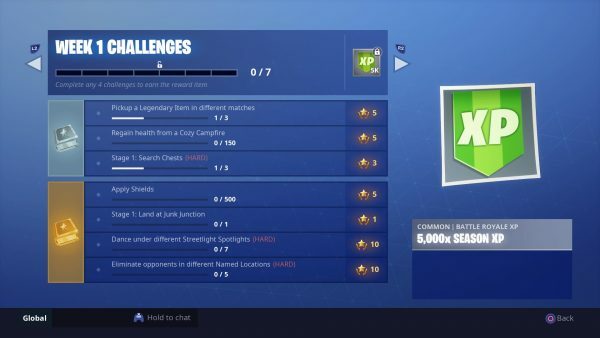 You can complete the challenges from any week in any order your like during Season 6, providing they’ve been released of course. You’ll need to find a Legendary Item in three separate matches, which will either be in a chest or lying around. Chests are going to be your best be in solo, but if you head over to 50v50 mode and make your way to the front lines there’s sure to be tons of legendary gear about. You only need to pick one up in a single game, so once you’ve grabbed it, you’re golden. For this challenge, you’ll need to regain 150 points of health from a Cozy Campfire. This is tricky, because not only do you have to find one, but have lost health and still be alive to heal. Campfires appear quite often as floor drops in named locations, so start there, then you can try damaging yourself with a fall so that you have health to regain. For the first stage of this challenge, you’ll need to unlock three chests. The second stage is to find two supply drops, which is quite easy to do in 50v50 where they spawn on the edge of the storm circle. We’re guessing that the final stage will be to find a Supply Llama. These are tricky customers to grab hold of, so check out our guide on how to find a supply llama. Drink a shield potion, glup some slurp juice, or eat a mushroom to fill your shield bar the equivalent of five full times. Simple. Exactly what it says on the tin: land at Junk Junction to complete this challenge. As the stages go on you’ll have to land in different named locations, so just enjoy the tour of the Fortnite map as the Battle Stars roll in. The second location is Tomato Temple. You’ll need to do a jig under Streetlight Spotlights seven times to unlock this one. Make sure you go to a streetlight that has speakers attached. You’ll need to kill five opponents, each in a different Named Location for this final challenge. Hang around in popular spots and this is sure to be a breeze, but if you want some real excitement head over to the newly floating Loot Lake as one of your locations – it’s sure to be teeming with people who want to look around.